The latest offering from Nat da Hatt, recorded in 2015-2016 in Kawaguchi City, Japan using an array of instruments, devices and machines including: a Zoom digital eight track recorder, A Gretsch Electromatic guitar and a Korg vocoder. 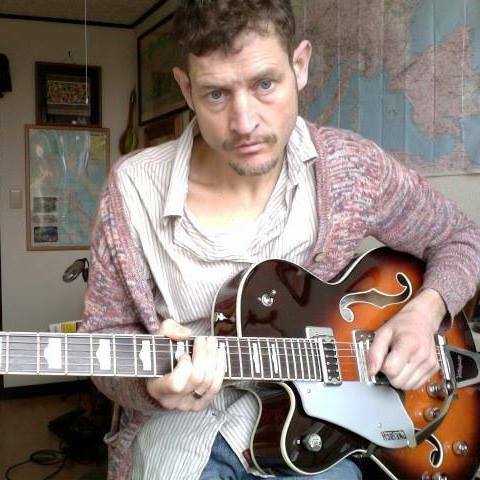 Nat da Hatt is a political refugee from New Zealand who has settled in Japan where he spends his days in a cave creating tone paintings on an array of devices and instruments including: guitar, thumb piano and a Korg vocoder. This entry was posted in 2016, Free mp3s, Music and tagged alternative, blues, electric guitar, electronic, experimental, Japan, jazz and improvised music, Kawaguchi, nat da hatt, New Zealand music, psychedelic rock, Saitama, turntablism. Music video from the album ‘South Island Sessions‘, set in 19th century New Zealand with an ecological theme. ‘The Ballad of William Knife’ was the name of the show we took to the Dunedin Fringe Festival in 2006. This entry was posted in 2006, 2016, Free mp3s, Music, New Zealand, video and tagged 19th century, 2000s music, Aotearoa, avant-garde, banjo, conservation, Dave Black, drums, ecology, electric, electric guitar, electroacoustic, electronica, experimental, fiffdimension, folk, folktronica, Frey, harmonica, Hayden Gifkins, invasive species, Kahurangi, kiwi, Marlborough, Matt Thornicroft, music, nelson, new zealand, New Zealand music, noise, saxophone, South Island, steampunk, steampunk folktronica, Suka, Tasman, Te Wai Pounamu, The Faraway Tree, video. Here’s a new bonus track we’ve added to the album ネオン列車の風景 Neon Train Landscapes – our version of a traditional shima uta (island song) from 沖縄 (Okinawa). As you can hear, the music of Okinawa is quite distinct from that of mainland Japan. This entry was posted in 2011, 2012, 2015, Asia, Free mp3s, Japan, Music, Travel, video and tagged acoustic guitar, Asia, Dave Black, electric guitar, electroacoustic, ethnomusicology, field recordings, folk, harmonica, Japan, nat da hatt, Okinawa, psychedelic, Ryukyu, sanshin, shakuhachi, traditional, 日本, 沖縄. by organist/conductor/arranger Nigel Patterson (The Black Seeds, The Manta Rays, Fly My Pretties), guitarist & organiser Dave Edwards (fiffdimension, The Winter), and over a dozen musicians on guitars, basses, drums, electronics, keyboards, trumpets and vocals, was the seed that grew into a full scale electric symphony: Evolution. “The 50-minute piece of music, broken down into six movements, was performed live over a few nights for the Fringe Festival in 2005; the group taking out the Best Music Award. “It was stunning. Discordant guitars were choked, drums clattered and crashed, voices mingled with percussion and keyboards – but this form of free-improvisation had a structure to it. It had movement, it had a plan. It was a great beast of a song that writhed and wriggled and often managed to run downhill, away from the players – in the best possible way. This entry was posted in 2005, Free mp3s, Music, New Zealand, video and tagged 2000s music, 2004, alternative, Ascension Band, avant-garde, Bell Murphy, Best Music award, Dave Edwards, drums, electric, electric guitar, Free mp3s, Frey, Fringe Festival, improvisation, kiwi, music, New Zealand Fringe Festival, New Zealand music, Newtown Community Centre, Nigel Patterson, piano, punk, rock, Ryan Prebble, Sam Jenks, Wellington, Wil Rattray. the first collaborative album by New Zealand artist/musician/filmmaker/ethnomusicologists Dave Black & Snake Beings – performed on guitars, bass, banjo, percussion, saxophones, clarinets, harmonicas, synthesisers, Indonesian gamelan, Okinawan sanshin, ukulele, violin, loop pedal, piano, drums and spoken word. (2014) Japanese psychedelic rock by Dave Black & Nat da Hatt – two New Zealanders living in Japan. and Dave and Cylvi contributed to Postmoderncore‘s first volume of Dada Songwriting Compilation, Rejection dryrot ripple Gombage. We’ll take a break from more releases for the remainder of this year while some new ideas percolate – thanks for listening, see you at the New Zealand Fringe Festival in 2016! This entry was posted in 2014, 2015, Free mp3s, Music, New Zealand and tagged 2010s music, acoustic, acoustic guitar, alternative, Asia, Dave Black, Dave Edwards, electric guitar, electroacoustic, experimental, field recordings, folk, Free mp3s, fusion, Japan, mashup, Mike Kingston, new zealand, New Zealand music, postmodern psychedelic rock, Simon O'Rorke, Simon Sweetman, Snake Beings, world, world fusion. Today is the last day of winter in the southern hemisphere – so to celebrate, here’s the fifth album from The Winter – a New Zealand free improvisation trio of Mike Kingston, Simon Sweetman and Dave Edwards… with a sound that swerves from acoustic folk/blues with hints of Asian, Celtic, and Balkan influences, to electroacoustic soundscapes, abstract dissonance, and pots & pans percussion. This entry was posted in 2010, 2015, Free mp3s, Music, New Zealand, The Winter and tagged 2010, 2010s music, 2015, acoustic, acoustic guitar, avant-garde, banjo, bass, clarinet, Dave Edwards, drums, electric, electric guitar, electroacoustic, folk, Fredd Marshall, Free improv, free jazz, Free mp3s, harmonica, improvisation, Mike Kingston, noise, percussion, Pyramid Club, sanshin, Simon Sweetman, The Winter, ukulele, Wellington. Bye 2014 – overall a pretty good year here. Most importantly we put out two new albums in contrasting styles: ネオン列車の風景 Neon Train Landscapes and in the non-idiomatic idiom in Norway. The first was a composed Japanese psychedelic rock album while the second showcased the free improvised music I’d been influenced by in my earlier years in Wellington. It was also a good year for travel to southeast Asia: I visited Singapore, Malaysia and Indonesia for the first time… and I finally returned home to New Zealand after two years living in Western Australia and a year before that in Okinawa. This entry was posted in 2014, 2015, Free mp3s, Music, Travel.